Value-based service delivery using our proprietary pricing model. 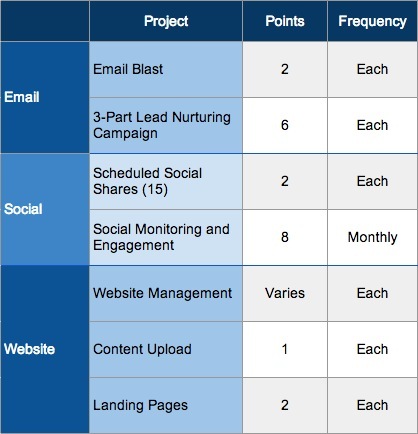 How do you plan a lead gen campaign? PR 20/20 uses a proprietary Point Pricing model. Each project within a campaign is assigned a fixed-point total (e.g. blog post = 3 points) based on value creation rather than hourly estimates. Regardless of how much time is invested to complete each project, the point totals remain constant, thereby ensuring that clients get the full value of every dollar spent. Point allocations are defined at the start of every month, and are based on an agreed-upon scope. This allows for more efficient and accurate forecasting and planning. See a sample section of our Standard Point Pricing Project Values chart below. A full version of the chart, complete with all available standard services and descriptions, is available to prospects and clients upon request. Note: Points can vary based on project scope, and are subject to change at anytime. A campaign is a series of projects designed to achieve a specific goal. A campaign has a targeted audience, timeline and budget.